My first blogger! Sandy Shaw is a sister entrepreneur and a conscious, warm-hearted woman. Taking part in a big event that you have to raise money for is life-changing and humbling. 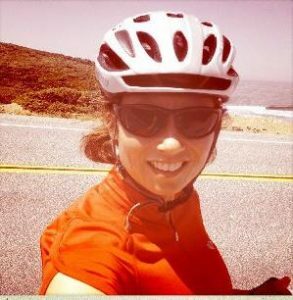 Take a look at what led to her decision to participate in the AIDS Lifecycle Ride. Taking a stand for what I believe in doing something that I love! Yes, I am, and that’s why I’m riding! I’m crazy with heartbreak that …ugh…Donald… yuck… Tr… eww…ump is our president. How? How is this possible? How did this happen? On the morning of November 8th, 2016, I was humming with excitement! I was certain that later that evening we would be celebrating our first woman president. I imagined us at post-election parties, high-fiving each other acknowledging how far we’ve come as a society; that we have made so much progress evolving to a higher standard of living guided by love. Then, the electoral votes came rolling in…one state after another, falling to Trump. What????? Late that night, the guillotine fell and it become clear that Trump had won the electoral vote. The next morning I woke feeling sick, exhausted from not sleeping, and my eyes swollen from crying. In this state of confusion, total beguilement and a feeling of “What reality was I living in thinking that our society was evolving to a more loving state of being? ?” I felt an inner-vertigo. Nothing made sense anymore. I felt I couldn’t even trust my own self because how could I feel so sure that Hillary would be our next President and actually be completely off-base and wrong? I was clearly living in a bubble of like-minded people, and out of touch with half of America. In the past, I have found that when I have such negative energy spiraling around inside of me, the best way to get it out was through heavy-duty, cardio exercise! I got on my bike to go for a ride. 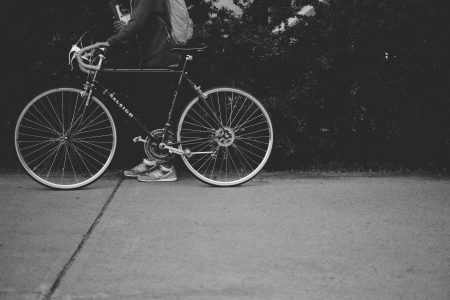 A very long ride… Peddling and peddling, lost in thought and present at the same time. Bike riding is my favorite form of meditation. I am able to release negative energy, gain positive energy and pedal out the confusion. It’s a mental savior for me. I love to go on long rides, along back mountain roads that are too rough and out of the way for cars to travel. The feeling of complete excursion peddling up a long hill, and the thrilling elation flying downhill at top speed. At the end of a ride, I feel peaceful and centered. Thank God for the bike! As you know, biking is my favorite way to finding inner peace, and by riding the Aids/Lifecycle Ride, I am taking a stand for my personal values and belief system. During these dark political times, I have decided that in the midst of such uncertainty, the one way I can feel a little bit better is if I personally show up in a bigger way to take a stand for the values I believe in. AIDS is NOT over! AIDS is STILL a problem! (In California alone there are 151,000 people living with HIV.) These agencies are vital to helping people with AIDS get access to medical care, emotional support so they can live longer and healthier lives. Prevention services geared towards high-risk populations will ensure that future generations will not experience the same level of loss that we have faced in the last two decades. Your current pain will fade but the good you will do in riding on behalf of the SF Aids Foundation will live on. Have a wonderful ride in July! I LOVE this article Sandy Shaw… It is honest, real and to the point. PERFECT for the conscious ADD-er that lives in me!! Proud to be your friend and maybe I can join you next year.